Groove 107.7FM Wellington, NZ: Two More Sleeps until WOMAD 2018!!! WOMAD - World of Music, Arts and Dance the internationally established festival, which brings together artists from all over the globe. The central aim of the WOMAD festival is to celebrate the world's many forms of music, arts and dance. As an organisation, WOMAD now works in many different ways, but our aims are always the same - at festivals, performance events, through recorded releases and through educational projects, we aim to excite, to inform, and to create awareness of the worth and potential of a multicultural society. We have presented more than one thousand artists at our festivals, bringing the expression of more than 100 different countries to a live audience of over one million people. 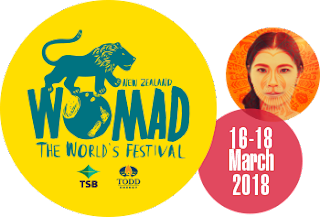 WOMAD New Zealand 2018 sees the 14th anniversary for WOMAD held at the stunning TSB Bowl of Brooklands and Brooklands Park, New Plymouth, Taranaki.